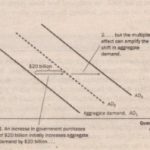 Because of the multiplier· effect, a dollar of government purchases can generate more than a dollar of aggregate demand. The logic of the multiplier effect, however, is not restricted to changes in government purchases. 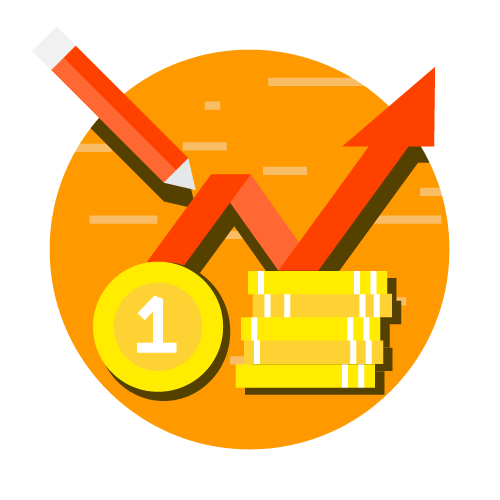 Instead, it applies to any event that alters spending on any component of GDP–consumption, investment, government purchases, or net exports. For example, suppose that a recession overseas reduces the demand for U.S. net exports by $10 billion. This reduced spending on u.s. goods and services depresses U.S. national income, which reduces spending by US. consumers. If the marginal propensity to consume is % and the multiplier }s”4, then the $10 billion in net exports means a $40 billion contraction in aggregate demand As another example, suppose that a stock-market boom increases households’ wealth and stimulates their spending on goods and services by $20 billion. This extra consumer spending increases national income, which in turn generates even more consumer spending. If the marginal propensity to consume is 3/4 and the multiplier is 4, then the initial impulse of $20 billion in consumer spending translates into an $80 billion increase in aggregate demand. The multiplier is an important concept in macroeconomics because it shows how the economy can amplify the impact of changes in spending. A small initial change in consumption, investment, government purchases, of net exports can end up having a large effect on aggregate demand and, therefore, the economy’s production of goods and services. Panel (a) shows the money market. When the government increases its purchases of goods and services, the ,. resulting increase in income raises the demand for money from MDI to MD2′ and this causes the equilibrium interest rate to rise from 71 to 72, Panel (b) shows the effects on aggregate demand. 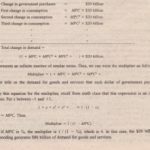 The initial impact of the increase in government purchases shifts the aggregate-demand curve from ADI to AD2• Yet because the interest rate is the cost of borrowing, the increase in the interest rate tends to reduce the quantity of goods and services demanded, particularly for investment goods. This crowding out of investment partially off sets the impact of the fiscal expansion on aggregate demand. In the end, the aggregate-demand curve shifts only to ADJ. purchases initially shifts the aggregate-demand curve from AD\ to AD2′ but once crowding out takes place, the aggregate-demand curve drops back to AD3• To sum up: When the government increases its purchases by $20 billion, the aggregate demand for goods and services could rise by more or less than $20 billion depending on whether the multiplier effect or the crowding-out effect is larger.